“Merck More than a Patient” is a new initiative of “Merck Cancer Access Program” in Africa. Merck in partnership with Kenya’s “Women For Cancer” started this initiative with the aim to empower women cancer survivors in Kenya through supporting them to establish their own small business so that they can lead an independent and productive life. “I am very happy that “Merck More than a Patient” has this positive impact on these women’s lives. Therefore, this initiative will be launched in other African countries in 2017. Through our collaboration with cancer patients associations and cancer institutions across Africa, we aim to help uplift women cancer survivors to reclaim their lives and become active contributors to the economy – and by doing so, they can now give back to the society through their new businesses. They will become more than cancer patients,” says Rasha Kelej, Chief Social Officer of Merck Healthcare. “Merck is helping us achieve our “Women 4 Cancer” goal of ensuring the women our programme assists are getting a new found hope of a better tomorrow beyond the suffering brought on by cancer,” Kithaka added. Rose Atieno Chiedo, a 46 year old mother of one who lives in Nairobi, Kenya, is a cervical cancer survivor. 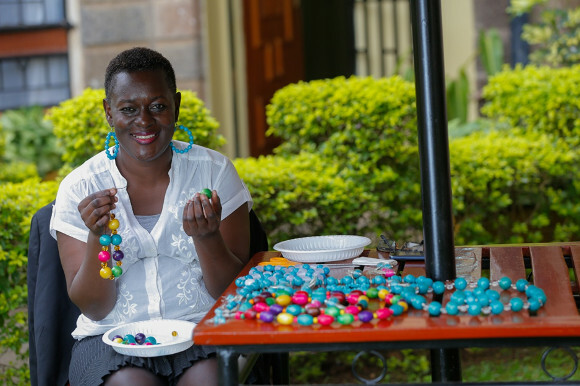 Rose used to make and sell samosas before her cancer diagnosis and after her recovery she started to make jewellery in a small scale to cover some of her needs. “Merck More than a Patient” has helped Rose to expand her jewellery business enabling her to generate a better and steady income to meet her needs and re-build her life. Rose used to complain of lower backaches and suffered from spotting. She went to Kenyatta National Hospital in Nairobi for further investigation where she found out that she had cervical cancer Stage 2B. “When I was diagnosed with cancer in July 2013 the first thing that came to my mind was death,” Rose says as she narrates her painful journey. “Basically that is what anyone would think. People have a negative attitude towards cancer. The perception is that it cannot be treated,” she adds. “I shared the news with my brother and he was shocked. He became very worried about my health and where the money to cater for my treatment would come from as we are orphans. There was no one who could help me other than him. It was a big blow to him because he knew the whole burden would be on him of which he actually took up,” Rose explains. “From the beginning to the end of my treatment it was just sad because I didn’t have money and I was depending on someone else for support. Before my illness, I used to sell samosas (a fried flour shell filled with minced meat or vegetables and spices) at that time at Ksh 5 per piece. So for 100 samosas I would get Ksh 500 (USD 5) in a day. But I was not able to manage the business as I would get weak and they are very heavy to carry and deliver for customers. So I stopped the business,” Rose says sadly. Rose was able to get treatment (radiotherapy and chemotherapy) in March 2014 after waiting for eight months. In August of the same year there was a recurrence and Rose had to go for further treatment. 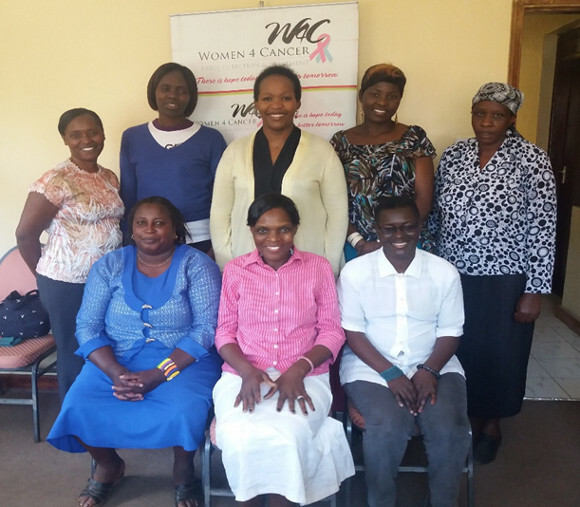 Women4Cancer a charitable organisation in Kenya supported her to cover her treatment in 2015. After recovery, Rose has been making jewellery but on a very small scale to sell and support herself and other needy women. Rose had a dream to expand the business and train other women to generate income so that they become productive members in society. “Merck More than a Patient” is a new initiative of Merck Cancer Access Program with the aim to empower women cancer survivors to re-build their shattered lives after the devastating cancer experience. It will help them to reclaim their lives and become active contributors to the economy,” says Rasha Kelej, Chief Social Officer, Merck Healthcare. “Merck More than a Patient” has helped Rose to expand her jewellery business. Moreover, it has enrolled her in the Kenya Chamber of Commerce – Women in Business body, which will help her network with other entrepreneurial women, thus giving her a platform to generate even more business. “What Merck has done is really going to help me to improve my business from small-scale to large-scale. I make my jewellery at home and sell it to my neighbors and friends. This business is something I can do at my convenience. I can carry the beads wherever I am going and I can sit anywhere and do my bead work,” Rose says with confidence and joy. 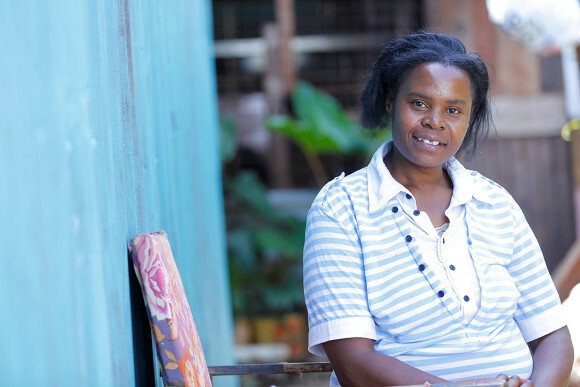 “I would really want to thank “Merck More than a Patient” and really appreciate them because this will help me to improve my life and will also enable me to use better quality materials because I can now be able to afford to buy them,” Rose adds. I am not a patient anymore. I am a survivor and I am a victor! Rose concludes. 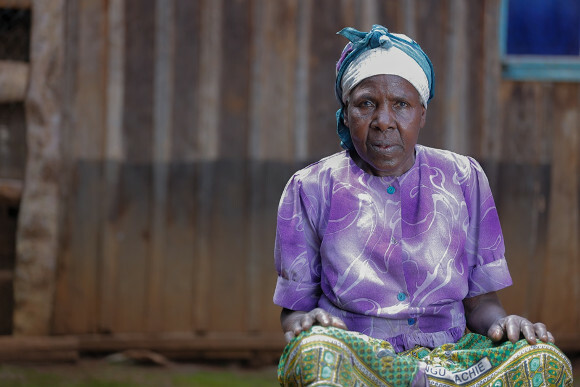 Esther Wakabari Muthike is a 75 year old widow from Kirinyaga in eastern Kenya and is a cancer survivor. Her husband passed away 25 years ago. 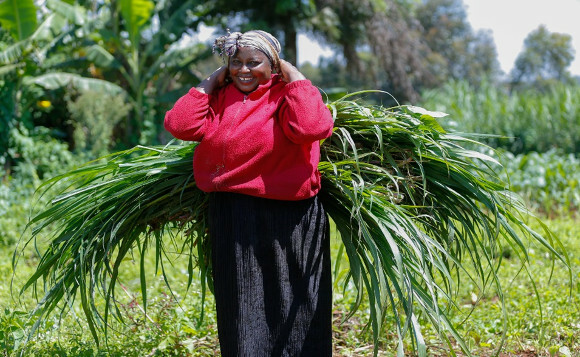 Before she fell ill, Esther was a farmer who also reared cows for milk. She had to sell her cow to cater for her cancer treatment expenses. 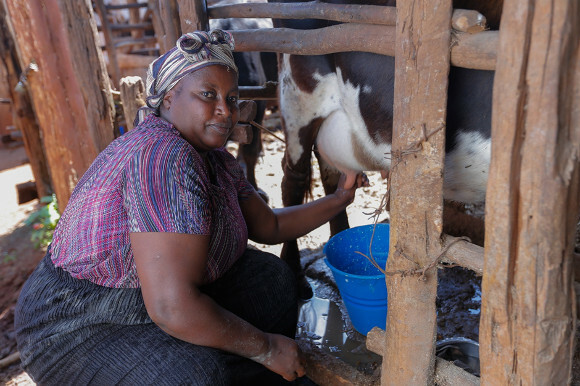 “Merck More than a Patient” has helped Esther to get a cow from which she is able to get milk to sell to cover her needs. 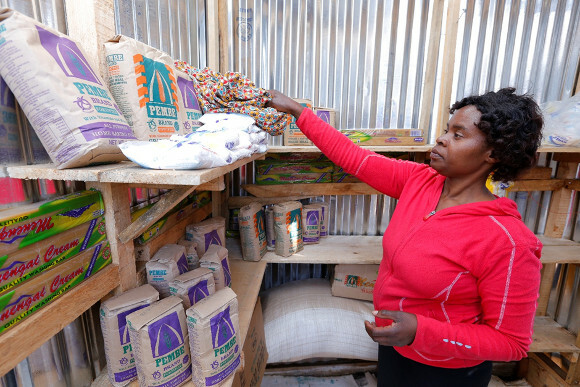 This has enabled Esther to get a steady income to become independent and re-build her life. Esther found out that she had cervical cancer in May 2015 at a medical camp organised by Women4Cancer. She was referred to Kenyatta National Hospital for further investigations and treatment in July 2015. She started radiotherapy and chemotherapy in September 2015 and finished treatment in November 2015. “When I was told I had cancer, I knew I would die even if I was being treated. The doctors told us that cancer is incurable,” Esther says. “I used to be a small-scale farmer and I also had a cow that provided me and family with milk to sell some for an income. But I had to sell my cow when I fell ill with cancer. 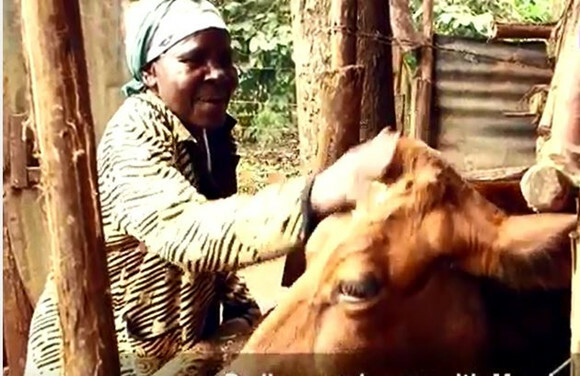 My daughter also sold her goats to help with the expenses,” Esther explains. Esther also stopped farming for a while due to the health issues and treatment procedures. However, after treatment, she went back to farming and hoped for help to buy a cow that would enable her to generate a steady income from the sale of milk to cater for her needs. “Merck More than a Patient” initiative aims to empower women cancer survivors in Africa. This initiative has supported Esther to buy a cow to replace the one she sold to cover her treatment and to enable her to meet her needs and become independent again,” says Rasha Kelej, Chief Social Officer, Merck Healthcare. “Merck has really changed my life by giving me a cow. I now feel better. I now get milk to drink and sell. I have money in my hands from the sale of the milk. Previously I was not getting any money. I have named this cow Wambui because of its beauty. Before, I used to borrow milk from my neighbours. But now I am enjoying milk from Wambui. Since I got Wambui, I pray for Merck every day that they bless others the way they have blessed me. I am a victor, I am not sick anymore,” Esther says with a smile. Margaret Wanjiku Njenga is a cervical cancer survivor from Kiambu, Kenya. Margaret who is 47 years old is married with six children. She was diagnosed with cancer in August 2013 at a medical camp run by Women4Cancer. She was an active business woman who used to make and sell soap and disinfectants to schools. She also had a cow whose milk she used to sell. She could not continue with the business after she fell ill and she also had to sell her cow. “Merck More than a Patient” has helped Margaret to get a cow which is about to give birth and she will have two. Margaret will be able to get a steady income from the sale of milk and be able to educate her children. At the hospital, Margaret was told she would need to have her uterus removed. “I went home and told my husband that I had cancer. Remembering how much pain my late mother had gone through and the amount of money she had spent on treatment and she still died, I told him it would be better to have my uterus removed so that I can raise my children,” she explains. “It didn’t mean that I would not die but I would have a few more years to live,” she adds. “I would lock myself in the house after my children go school. I would think a lot and cry. I always saw myself dying. Who would take care of my children? I asked myself. My heart was very troubled,” Margaret narrates sadly. “Before I became sick I used to make and sell home-made soap. I would go to schools to look for orders to supply them with the soap. I also started supplying the schools with toilet disinfectant. When I was diagnosed with cancer, I had to stop this job as it required walking long distances,” says Margaret. “A friend who also had her uterus removed loaned me Ksh 10,000 (USD 100) to book for treatment at the hospital. I also had a cow whose milk I used to sell. I had to sell my cow so that I could raise money for my treatment as I did not have the Ksh 30,000 (USD 300) required for the treatment all at once. I was also too stressed such that I could not work,” Margaret adds. When Margaret came from hospital she was unable to continue with the business she used to do before and they were struggling financially as a family. Their children were sent away from school for lack of fees as the money was not enough as she still had to buy medicine. Merck through “Merck More than a Patient” has helped Margaret to buy a cow that will enable her financially through selling milk. “I am very happy because “Merck More than a Patient” has come to my aid and bought me a cow that will help me to continue raising my children. They have uplifted me and I am very happy and may God bless them,” Margaret says with joy. Loise Wambui Kimani from Dagoretti, Nairobi was diagnosed with cervical cancer in August 2015. Loise who is 45 years and is married with five children has been struggling to take care of her family ever since as she had to stop working as a house help for a living. “Merck More than a Patient” has helped Loise to establish a shop from which she is able to get a steady income to cater for her needs and that of her family. “I used to work as a house-help and used to be paid Ksh 6,000 (USD 60) per month which helped me cater for my children’s needs. When I was diagnosed with cancer I continued working but had to stop as I could not cope with the work load,” Loise explains. “I heard that anyone with cancer dies. I imagined I would die. I was in shock. I told my friends I had cancer but most of them told me when you have cancer you don’t live for long that someone just dies. I thought my life had come to an end,” Loise says. “People around me rejected me and thought I would infect them with cancer,” Loise says with sadness. “I eventually had my uterus removed and started radiotherapy in January 2016. When I came back home from the hospital, life became very hard. My husband became the sole breadwinner unlike before when we used to help each other. Our combined income used to help sustain the family,” she adds. Merck through “Merck More than a Patient” has helped Loise establish a shop which is giving her a steady income and enabling her to take care of her family’s needs. “Merck has been very helpful because they have opened a shop for me and I am already enjoying the benefits. This shop is helping me to bring up my children and now I am able to help my husband,” Loise says with a smile. “I would like Merck to continue helping other cancer survivors because the disease is financially draining and when Merck comes in to help the burden becomes lighter. I thank them because they have done great things and God bless them very much. I am doing well, I am healed and I am a victor,” she says. “Merck More than a Patient initiative aims to empower women cancer survivors by helping them to establish a small business in order to generate a steady income to cater for their needs and enable them to re-build their lives,” says Rasha Kelej, Chief Social Officer, Merck Healthcare.